In the northern part of North America, most butterfliers in the fall hang up their binoculars and cameras and head into semi-hibernation. However, more than a few simply head south in November to the Lower Rio Grande Valley in Texas. I have joined them from Ontario in the past two years and have been astounded by the results. While butterflies in most parts of the continent disappearor drastically dwindle by autumn, the number of species and individuals in southern Texas increases exponentially. Even on overcast days, you can see hundreds and even thousands of butterflies. Over about a month in the combined last two Novembers, I found 118 different species. Why so many? Most southern butterfly species have two or more generations per year and each builds up as the year goes on with the seeming highest numbers in the fall while the weather remains warmer than further north. There are also many Mexican species that just reach the northernmost part of their breeding distribution in the semi-tropical valley, while a number of vagrants and occasional breeders from Mexico also regularly make their way north in the autumn. As well, there are those extremely enticing accidentals that show up occasionally in the valley, most often in the fall. Finally, and perhaps most importantly, many landowners, including federal, state and municipal authorities, have combined to plant manypublically accessible butterfly gardens along the length of the lower valley and these act as magnets for the butterflies and concentrate their numbers, making them easy to find along the LRGV Butterfly Trail. An incredibly valuable source of information for all the butterfly and birding sites in the valley is called the Official Birding and Butterfly Map of the Rio Grande Valley and can be picked up free at any valley nature centre. Highlights from the last two Novembers are not easy to decide upon because there are simply so many. I will try to settle on those that will give some indications of how to maximize your butterfly time in the valley. I say ‘your’ time because I know many of you will not be able to resist a visit and don’t forget that eButterfly will benefit tremendously from your added contributions. 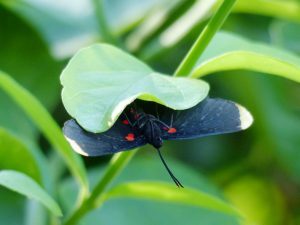 For sheer numbers and regular rarities and accidentals, several visits to the National Butterfly Center in Mission are a must. The extensive gardens planted to nectaring and larval foodplants have attracted a very large variety of species over the years. 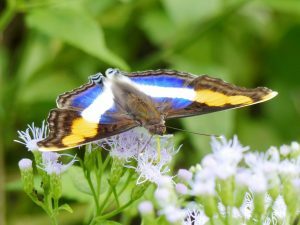 In my times there, I came up with such rarities as Malachite, Silver Emperor, Pavon Emperor, Marius Hairstreak, Curve-winged Metalmark and Giant White. 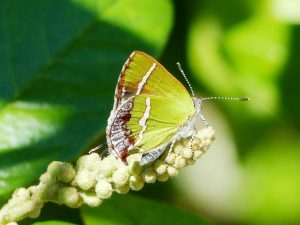 Among the expected regulars, you should find the uncommon Mexican Bluewing, Tropical Leafwing, White-striped Longtail, Turk’s Cap White-Skipper, Purple-washed Skipper, Silver-banded Hairstreak and Red-bordered Pixie. However, to find these you have to sort through the often hundreds and even thousands of Queens, American Snouts and Large Orange Sulphurs and other common butterflies. 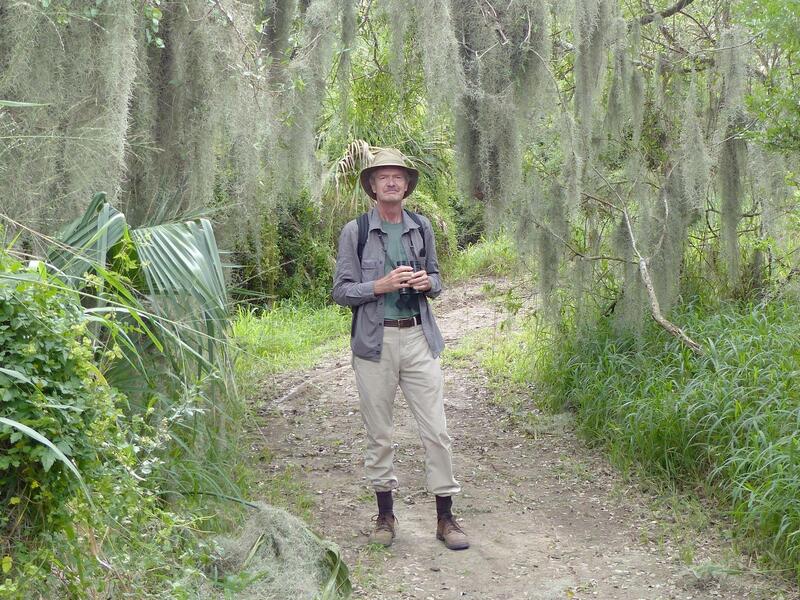 In one day alone, I discovered 63 species at this site. Visits to two of the federal and state parks in the central LRGV should also be high on your lists. Santa Ana National Wildlife Reserve and the nearby Bentsen-Rio Grande Valley State Park often turn up many rarities along the miles of easily accessible nature trails. Some uncommon species I have seen at these two locations include Mazans Scallopwing, White-patched Skipper, Common Mellana, Red-bordered Metalmark and the rare Blue-eyed Sailor. 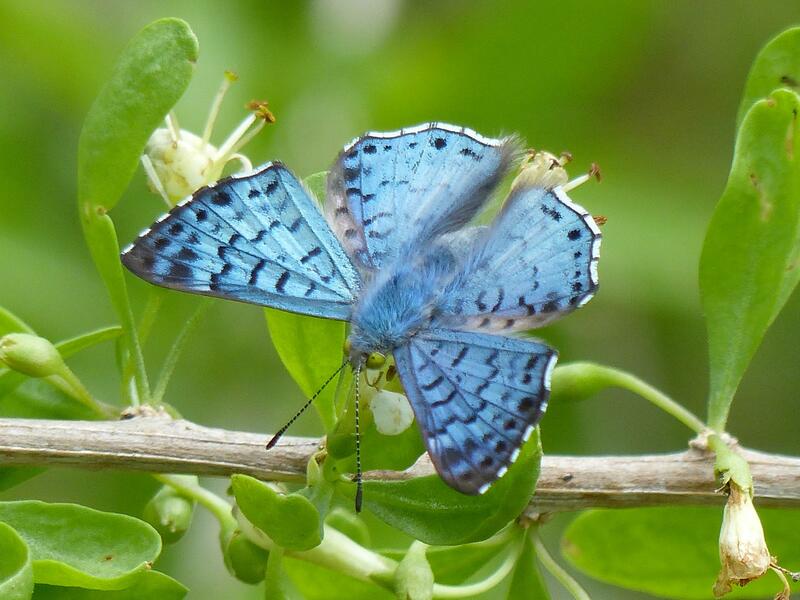 A newer nature reserve called Estero Llano Grande in Weslaco is both a pleasure for viewing extensive wetlands (for birds and butterflies) and productive for butterflies. Some unusual species I found here were Brazilian and Guava Skippers, Falcate Skipper and Clytie Ministreak. There are many smaller- to medium-sized butterfly gardens in the LRGV that invite visits from the public. They are most often run by NGOs or municipal governments. Some are also World Birding Centers. Weslaco, Mission and Alamo have a large number of these sites and they can be discovered through municipal websites and brochures. Trips east to the gulf coast and west upriver to the Falcon State Park are also recommended to find some of the specialties not easily found in the central part of the valley. Further east at sites like the Sabal Palm Audubon Sanctuary near Brownsville can be found Double-dotted Skipper, Blue Metalmark and Mangrove Buckeye. The drier brushlands further west produced for me Gray Cracker, Coyote Cloudywing, Texas Powdered-Skipper and Nyasa Roadside-Skipper. One final mention should be made of a butterfly phenomenon I encountered this year at the Yturria Tract trail just to the west of La Joya. After seeing hundreds of butterflies crossing the main highway 83 in front of me, I stopped at this location. In walking the nearby trail, there was a blizzard of American Snouts. They were mostly heading southward and I estimated tens of thousands of snouts were involved. Every day in the LRGV in November holds wonderful butterfly opportunities and surprises. So for all you who are now planning your trip, I highly recommend two books by Roland Wauer. 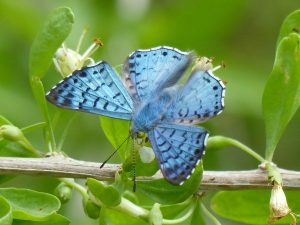 These are Butterflies of the Lower Rio Grande Valley and Finding Butterflies in Texas: A guide to the best sites.